On the second day of the waiting period, competition kicked off at mid-tide with two-foot crumbly sets coming through. Aussie Ryan Callinan, one of the Top 10 QS surfers to qualify for this year’s tour, hit the water with Brazilian Italo Ferreira and Hawaiian Keanu Asing for Round 1, Heat 1. Ferreira won by 0.90 over Callinan’s 11.10 and Asing’s 8.80 and goes straight through to round 3 alongside other winners of Round 1. Heat 2 saw Tahitian Michel Bourez take the win with 11.50 over Australians Adam Melling’s 10.37 and Julian Wilson’s 6.06. Last year’s winner Filipe Toledo and injury replacement Stuart Kennedy entered heat 3 with Brazilian Jadson Andre. Filipe showed a great heat 3 performance with a 14.36 win over Andre’s 13.30 and Kennedy’s 10.67.
low Brazilian Gabriel Medina and Hawaiian Sebastian Zietz. Medina kept busy and Zietz mixed things up to take the lead until Medina waited until the last minute to take an 8.50 and charge through to round 3 with 16.17 over Zietz’s 14.80 and Ibelli’s 8.60. 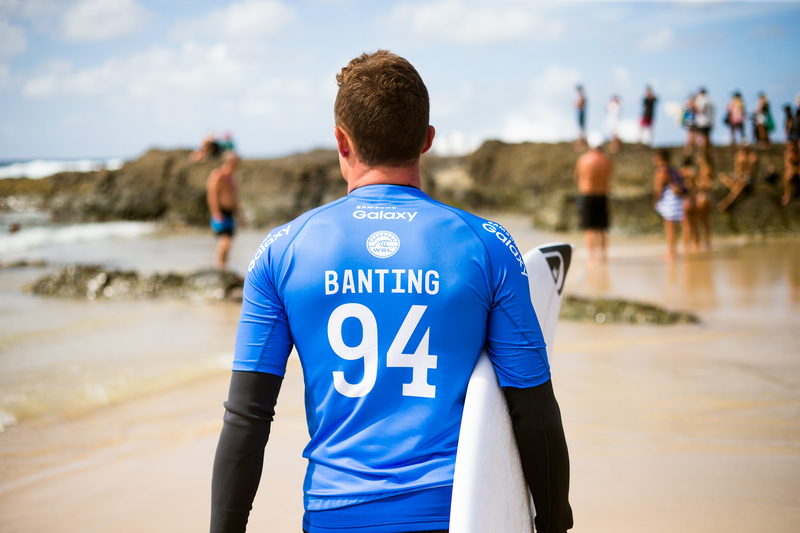 Snapper local Mick Fanning was in the water with Matt Banting returning from injury for his first WCT event in months and trials winner Wade Carmichael for Round 1, Heat 5 in an all Australian heat. Carmichael with nothing to lose grabbed a big score with a 8.93. Fanning answered back with a 8.37 and a heat total of 17.24 go to straight to round 3 with heat scores from Carmichael of 16.00 and Banting’s 9.90. 2015 World Champion Adriano de Souza entered the water for heat 6 with wildcard Mikey Wright and Kolohe Andino. Andino kicked off with a 9.10. It was a close heat with scores and Wright finished with the win of a score of 13.74 and de Souza’s 13.70 and and Andino’s 13.67 which dropped to a 9.10 for an interference. The swell started to double-up and Jeremy Flores wasted no time kicking off his ninth year on tour by taking the first wave in heat 7 against Australian Adrian Buchan and rookie Australian Davey Cathels. Flores and Cathels showed their flair and kept close scores for the heat win by Flores with a 15.90 to Cathels 15.00 and Buchan’s 10.74. Heat 8 saw Kelly Slater, Matt Wilkinson and rookie Conner Coffin in the water. Slater started with a 7.67 but didn’t find a solid second score to overtake Wilkinson who finished with a 9.33 taking his heat total to 17.00 over Slater’s 13.27 and Coffin’s 12.17. An all goofy match-up with Australian Kai Otton, American Nat Young and Brazilian Alex Ribeiro in heat 9 saw a close heat with Young going through to round 3 with 12.87 and Ribeiro 12.14 and Otton’s 11.50. Rookie Kanoa Igarashi hit the water with veterans Josh Kerr and Taj Burrow. Igarashi kept busy throughout the heat but couldn’t match Burrow’s 15.40 and Kerr’s 12.26 with his 11.40. 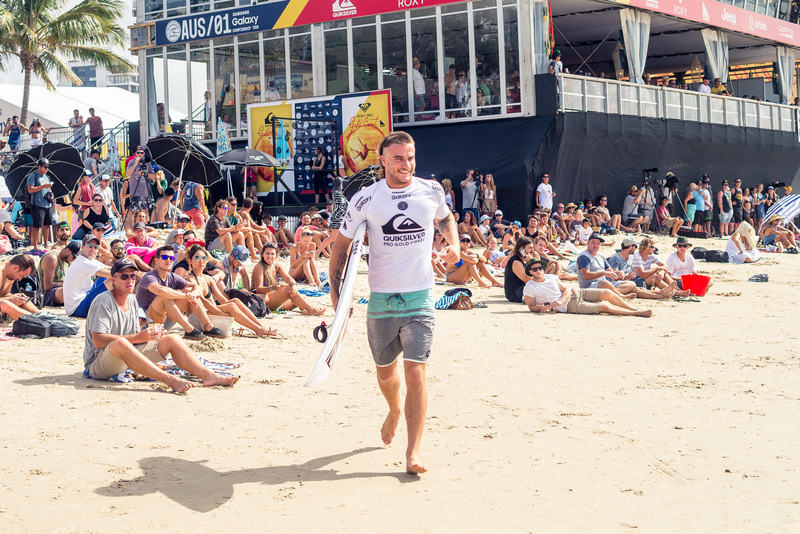 Jordy Smith returned to the tour in heat 11 against Wiggolly Dantas and Miguel Pupo. Dantas had a strong start to the heat with an 8.33 on his third wave and continued to dominate throughout to win with a 17.26 against Smith’s 13.43 and Pupo’s 12.47. The final heat of round 1 saw Joel Parkinson, John John Florence and Jack Freestone wrap up the day. All started the heat with big scores of 8.60, 7.33 and 7.17 respectively. Parko took the heat with 14.10 to Florence’s 13.56 and Freestone’s 13.44.